That's an amazing dress! Perfect for hot summer days. I love the little cut-outs! And I've been obsessively watching the Olympics as well - especially swimming, volleyball, and gymnastics! You look adorable! :) Great summery dress. i love the second pic!!! That is the cutest dress ever I love it. 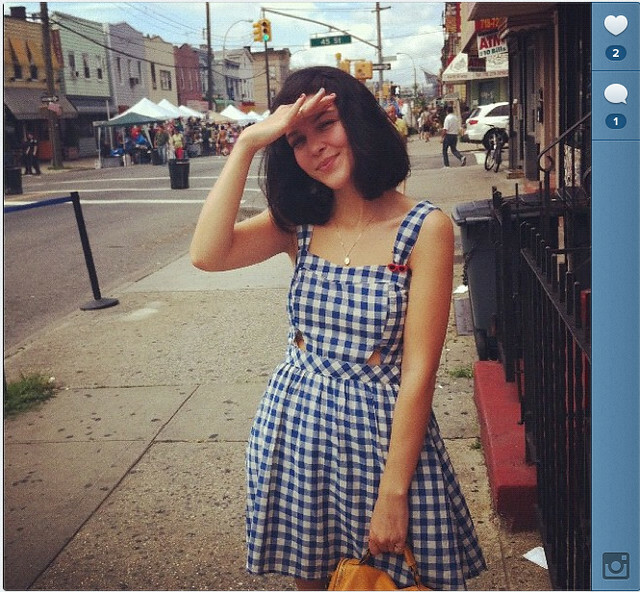 adorable retro gingham dress!! love the pictures!! This dress is gorgeous on you! I will be participating in the giveaway for sure! Beautiful dress! How do you find their sizing? It looks crazy short on the model on Dahlia's website, so not sure whether to go S or M.
You know, I was quite worried about that too but I think I'm probably much less long legged than the models and so it fits me a bit longer. Because of the cutouts it is not a work dress, so I wasn't overly concerned about it. That dress breaks cuteness records. Can't wait for the giveaway! Oh my gosh, soosh! Really!? Too sweet. How are you?? I'm gonna send you an email today. This dress is similar to this 1960s vintage pattern I found on Etsy :) I love it and totally want to make one for myself! OMG THAT PANT SUIT! THIS IS AMAZING. Thanks so much for sharing!!! Did you enter the giveaway contest?? I haven't checked the comments yet today. Oh that dress is so adorable! It looks perfect on you. I really love the cutouts at the waist. Such a nice detail! This dress looks amazing on you, it really fits your style!